Marian Rivera is part of the big-budget movie "My Big Bossing", the Festival King Vic Sotto's entry in the 40th Metro Manila Film Festival or MMFF 2014. The fantasy-adventure comedy movie also stars Ryzza Mae Dizon, Pauleen Luna, Nikki Gil, Alonso Muhlach and many more. Marian attended the movie's red carpet premiere at SM Megamall last night, but not today's MMFF 2014 Parade of Stars. I thought it was sure already that Marian would be part of the parade held earlier today. In one article from GMA website, it was reported that the Kapuso Primetime Queen was sure to be joining the float of "My Big Bossing" for the parade. But sadly, no Marian Rivera was seen on board the float with Bossing Vic and the rest of the stars, which might have caused disappointment to many of her fans who went to the parade just to catch her. But let's just understand that this bride-to-be is already busy with her and Dingdong Dantes' upcoming wedding, which is just 7 days to go. Soooo excited of their very special day! 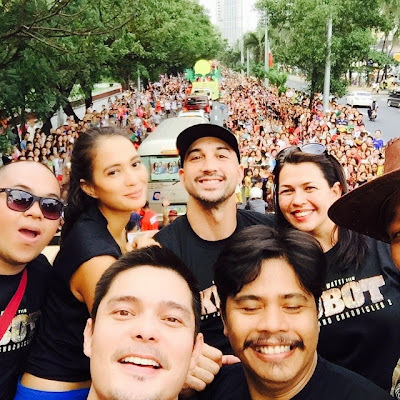 Not like Marian though, the groom-to-be was so present at the parade as he led the stars on the float of his entry "Kubot: The Aswang Chronicles Part 2". He was joined by Isabelle Daza, Lotlot De Leon, Julie Anne San Jose, Abra, KC Montero and more. A sequel to 2012's "Tiktik: The Aswang Chronicles" and directed once again by Erik Matti, "Kubot" is one of the 3 MMFF 2014 official entries which have been Graded A by the Cinema Evaulation Board (CEB). The other 2 are "Feng Shui" and "Bonifacio: Ang Unang Pangulo". The entries "English Only, Please" and "Shake, Rattle & Roll XV" meanwhile have been Graded B. The MMFF 2014 officially opens in all theaters in the Philippines on Christmas Day, December 25.